We don’t discriminate against holidays here at WegoWise, but we do have our favorites. Halloween is one of them! Fun decorations, costume parties, scary movies and spooky snacks are all part of our fall celebration. To keep with our company’s mission, we also try to make our holidays as eco-friendly as possible. Here are some tips to keep this (at times) excessive holiday on the green side. The most important part of Halloween is the costume! But new costumes from a store often involve excess packaging, brand new materials, harmful chemicals and require gas for shipping. A reported 10% of the world’s carbon emissions come from the textile and apparel industry. Think about the carbon footprint of that out-of-the-box Superman costume! Instead, find a costume out of recycled goods. This could mean searching through your own treasures, raiding your friends and families’ closets or heading to a local thrift store. Goodwill and Salvation Army have tons of great finds to inspire you. Online sites like Ebay and Amazon offer a “used” category while other online consignment sites like ThredUp or Craigslist sell people’s used goods, too. So not only will you look authentic, you will feel happy that your costume is earth-friendly. You might be the Halloween version of the Grinch on your street, but think about how much waste is associated with individually wrapped candy! The EPA reports that packaging constitutes 30% of municipal solid waste in the U.S. Plus, they’re terrible for your health. The neighborhood kids might be a little disappointed at first but their tummies will thank you later. We do understand if not giving out candy is not an option. If you are going to give out treats, consider something homemade or organic. Greenhalloween.org lists many all-natural options for you to choose from. Alternatively, Unreal Candy has created delicious treats without all of the chemicals and preservatives many candies include. At the very least, choose candy that comes in recyclable packaging like cardboard boxes. A couple of good options are Dots and Junior Mints. 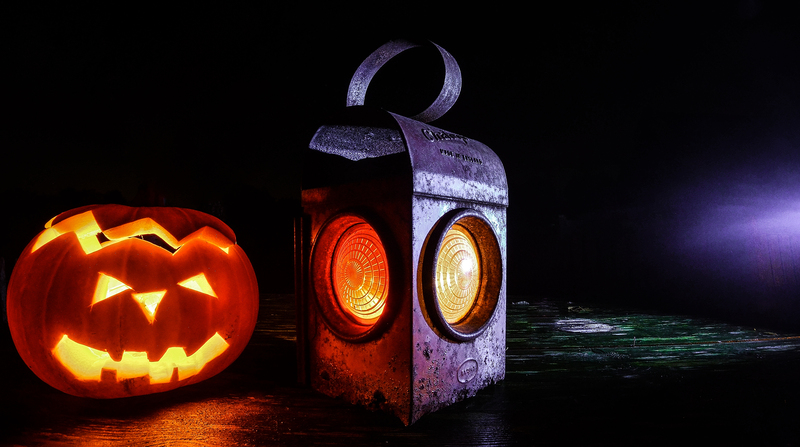 Save energy by keeping your house dark (and spooky!). Turn all your indoor lights off and only keep porch lights on for safety. You should do this all year round, but you have a special excuse during Halloween. Celebrate the holiday with extra scariness in the dark, or have fun with renewable battery-powered flashlights for a ghoulish twist. It will reduce your energy usage along with your electric bill.